Today was a day of firsts for me, including eating cereal out of its own cardboard box with ultra-pasteurized no-refrigeration-needed milk, smoking a few puffs out of a bong (er, “shisha” or “hookah pipe”) in a bar, and eating marshmallows for the first time in, oh, 10 years. But the real excitement was not this super-unhealthy “dinner” but rather horseback riding in picturesque Caldera, which is just south of Boquete. Franklin, my guide, and I spent a couple of hours riding to the top of the mountain, enjoying some of the most preciosa views I have ever seen. In addition, we had pleasant conversations about everything from songs by Enrique Inglesias (basura or garbage, he said) to U.S. politics (ditto). 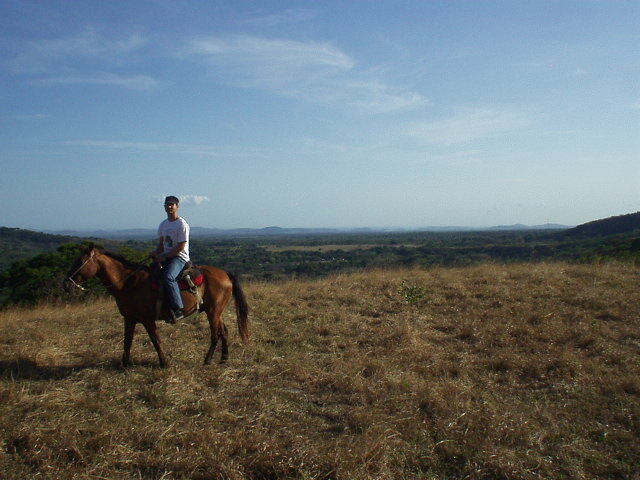 Here’s a recap of horseback riding in Caldera.